With this app you can read on your Gear notifications you receive on your mobile and also respond to many predefined as well with a small keyboard. By default are including many of the messaging Apps and Gmail, but is fully configurable options App. If you want to include other notifications, you must activate it so that every time you get a new one, it ask you and thereafter will show it. If you change your mind then you can change the allowed or denied Apps in the Notifications menu option. If enabled, then on the main screen you can see which apps are enabled. The initial purpose of the app is to emulate the behavior of notifications Android Wear in our gear Samsung. – 2: Content scrollable Notification. – 4,5,6: Answer options if any. If the background is blue, pressing the action will take place on mobile. If the background is red, pressing the action will take place on the gear. In the clock, we have preconfigured responses but you can include your own answers. To do this you have to edit the file located in the root of your SD called GearOptions.txt . To change the screen you have to do a swipe left or right. If you are in the first screen and do one swipe to the right, the notification will be deleted in the watch and phone. You can use the bezel as well. When there are more than one notification on the clock the notifications number appears in the top. To change it, do swipe up and down. The notifications for the same contact who are stored in the watch are grouped, so that will appear on the upper parte of second screen. Tap on the number and a new screen will show a summary of all messages. If you click on any of them you will see in detail. This App must be selected! This App read notifications through the API and can only access the possibility of answers and images (whatsapp) when no notification waiting on mobile. When the notification is extended (as you can see in the mobile), then yes you can and gives the possibility and also stores it for the next time. So the app learns, but lose it each time the phone is rebooted or the App is updated. Pressing the button takes you to a zone configuration to try to connect. When not working, the best way is to deactivate and then reactivate the bluetooth on the phone. In the configuration screen you can also enable or disable the notifications on the clock. The same mode that reply works, you can send new Whatsapp or Telegram messages to the previously stored contacts. At App settings, you can change the behavior of the App. Messages text size and the vibration numbers of every type of notification. 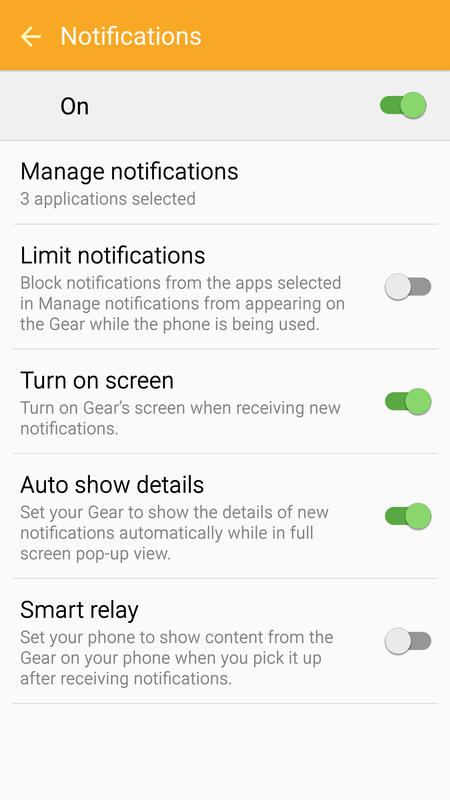 If you want to receive notifications when the gear is not connected by bluetooth, you must select this App notifications at Gear Manager Settings and enable this option at settings. Please, go to notifications settings with the App installed and disable that the App can read notifications. After that, uninstall and install it again!